DVD to iPhone software can convert DVD to MP4, M4V, H.264, MPEG-4 video compatible with iPhone, Apple TV and iPod with sharp picture and perfect audio.It is super fast and simple to convert DVDs to iPhone, convert various video files to iPhone . If you want to watch DVDS on ipone or other media players, the first thing you need to do is to convert DVDS to other video or other audio files , which is widely used by Windows Media Player. Now you may download the below free trial DVD to iPhone converter programs to do it yourself. Aimersoft DVD to iPhone Converter is a powerful yet easy-to-use iPhone converter that can convert DVD to iPhone MP4 M4V video (MPEG-4) H.264, rip DVD audio to iPhone MP3 and M4A audio formats, and copy your DVD movies onto Apple iPhone with great quality. 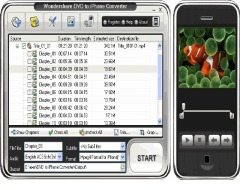 With this Phone converter, you can also convert DVD to other Apple mobile devices including iPod and Apple TV. 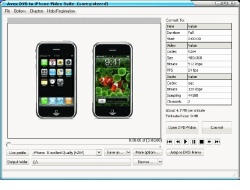 Cucusoft DVD to iPhone Converter is the easiest-to-use and fastest DVD to iPhone converter software for Apple iPhone on the market. It can convert almost all kinds of DVD to iPhone format. It is also a powerful DVD to iPhone converter due to the conversion speed is far faster than real-time. You will enjoy your favorite DVDs on your iPhone as a DVD Player. The latest version includes two running modes, one is "Direct Mode", the other is "Batch Mode". Avex DVD to iPhone Video Suite is a One-click, All-in-One solution to create iPhone movies from DVDs, TV shows and home videos. 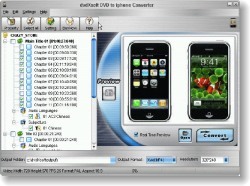 The software combines DVD to iPhone Converter ($29) and iPhone Video Converter ($29) in one package at great discount.